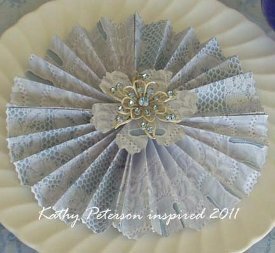 Using your Flip-Pal TM Mobile Scanner you can make this dainty vintage party favor using the pattern of vintage lace. 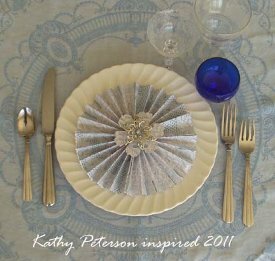 Decorate your home, give it as a gift or use it as a centerpiece. Kathy Peterson really came up with a great idea. 2. Then I printed it out from my computer. I made 2 copies, cut each in half, then folded and glued accordion style! 3. To top it all off I cut out a flower shape and added a vintage rhinestone pin. These pretty vintage look favors would be a lovely keepsake for a bridal shower or birthday party! Printing out the fabric design is a great way to get the look without a lot of fuss! 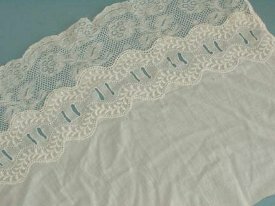 Another option would be to use real,lace that has been stiffened with decopage solution, then gathered loosely in the center! Shading this with pastel color,pencil would give it a very pretty look as well. Great idea and this could even lend itself to being a nice brooch pin or hair barrette too!